Tradition for many years held strongly to the belief that the 33rd Regiment was originally raised around Sowerby, Near Halifax. However though it is not possible to be precise about the recruiting area, the evidence points to most of the soldiers coming from Gloucestershire where it’s first muster was held. There can be no doubt though that by the time of the American War of Independence the Regiment had established a strong link with the West Riding and it’s from from this time also that the Regiment’s nickname “The Havercake Lads” begins to appear, the Havercake being the traditional Yorkshire Oat (hafer) cake. However it was not until 1782 that an established link with the West Riding was to be recognised. It was then that, to encourage recruiting, it was decided infantry regiments should be associated with particular counties and the Colonels of all non ‘Royal’ Regiments were written to, asking which county they would like to be linked with. 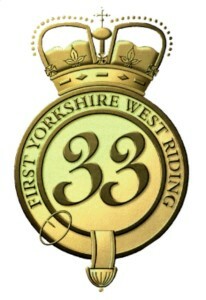 “33rd (or the 1st West Yorkshire West Riding) Regiment of Foot”. Though the Regiment’s title changed again in 1853 to the “33rd (Duke of Wellington’s) Regiment” to mark it’s long-standing ties with the 1st Duke, it did not lose it’s recruiting links with the West Riding. In 1873 the War Office adopted a plan whereby Regiments were to be brigaded (Paired Off) and based on a depot. It was decided under this plan that the 33rd (Duke of Wellington’s) Regiment and the 76th (Hindoostan) Regiment were to be brigaded together and that their depot should be in Halifax at Highroad Well. The decision to include Halifax amongst those towns in which a a military depot was to be established immediately invoked a strong local opposition. Sermons were preached against the proposal, meetings held to enlist support for opposition. 10,000 leaflets were distributed in the town urging people to sign a petition against the establishment of the depot and an office was opened in the town at which people could put their names to the petition. Finally a public meeting was held at which the chairman told a spirited audience, “Only those who live in the military towns can adequately judge the effects of congregating large numbers of men without the opportunity of entering into the married state”. One speaker said the depots “Tended to gather together a number of idle men such as could not be employed in factories”. Another said that he had understood that a drum and fife band was to play through the streets to attract recruits, and this would keep factory operatives in a state of excitement instead of being untroubled in their industry”. There was however, an equally active faction who welcomed the idea and this faction also prepared a petition urging that “The bringing into contact of Regular members of the Military Forces and the general public would produce a great military spirit”. The “Pro’s” petition was handed over to the Right Honorable Edward Cardwell, Secretary of State for War on the 24th of March 1873. Two days later the petition from the “Con’s” was also handed to him. The “Con’s” petition, signed by 4,664 persons, included 5 Magistrates, 5 Aldermen, 13 Councillors, 17 ministers of religion and over 300 tradesmen and shopkeepers. The petition set out that “The selection of Halifax as a military centre was contrary to the wishes of the inhabitants and that such centres should not be established in prosperous industrial districts, inasmuch as they offered strong inducements to irregularity and neglect of work and tended generally to demoralisation and immorality”. According to the Halifax Guardian of the time, the deputation did not succeed in putting up a very convincing case for opposition to the plan and on the 1st of April 1873 a telegram was received in Halifax from Colonel Ackroyd MP to the effect that the war office had decided to proceed with their plans. The barracks were finally completed in 1877 and on the 1st of September of that year they were occupied by the Depot Companies of the 33rd (Duke of Wellington’s) Regiment and the 76th (Hindoostan) Regiment. For the Next 80+ years, until it’s closure in 1959, the depot was to be the ‘home’ for the Regiment, where all it’s recruits were trained. 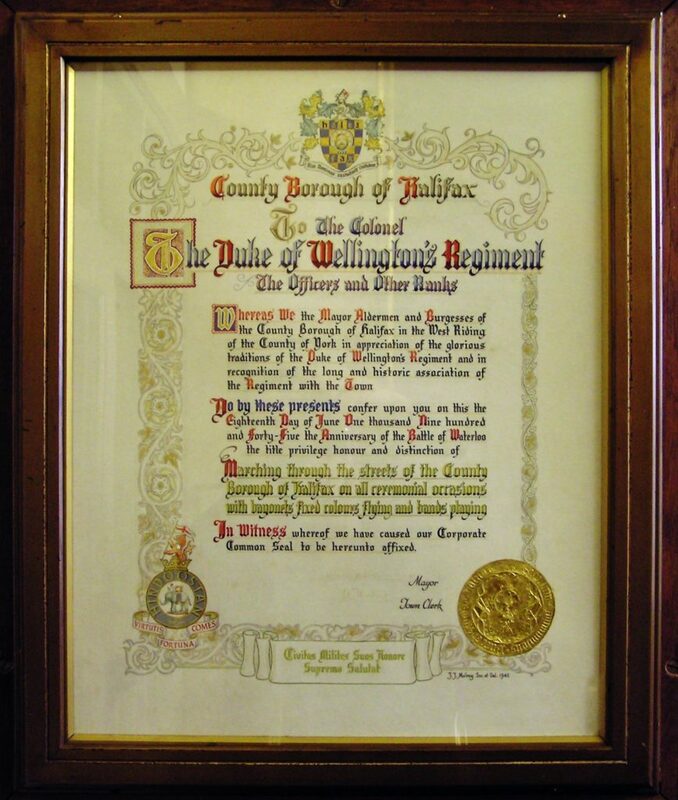 Halifax is still home to the Regiments Headquarters, Museum and Regimental Chapel in the Parish Church. Officers Mess and Depot CO’s House, Wellesley Barracks, Halifax. The Dukes were granted the ‘Freedom’ of several towns and districts. This Freedom granted the Regiment the right to parade through the towns or districts with:- Bands Playing, Colours Flying and Bayonets Fixed. The first was Halifax Corporation in 1945, though it was not until 1952 that the Regiment exercised its option to march through the town. That same year Huddersfield Borough Council followed by also presenting the freedom of the town, with a Parade in Greenhead Park. On the 25th of March 1979 Kirklees Metropolitan Borough Council gave the Freedom of Kirklees to the Yorkshire Volunteers. The 3rd Battalion was the Duke of Wellington’s Territorial Army unit. However the freedom scroll did not include the wording ‘Heirs and Successors’. Therefore when 3DWR became part of the East and West Riding Regiment the Freedom was technically ended. The Freedom of the County Borough of Huddersfield, given to the Regiment in 1952, also omitted the wording Heirs and Successors. Therefore that Freedom also ended upon the rebadging of the Dukes to the ‘Yorkshire Regiment’ in 2006. The Dukes exercised Freedom rights in Keighley, at their request, on the basis that Keighley was a part of Bradford and the Regiment took over the Freedom of Bradford from 70th Field Regiment RA, through a very convoluted and interesting series of ‘Heirs and Successors’ built in to the original 1945 Freedom scroll. 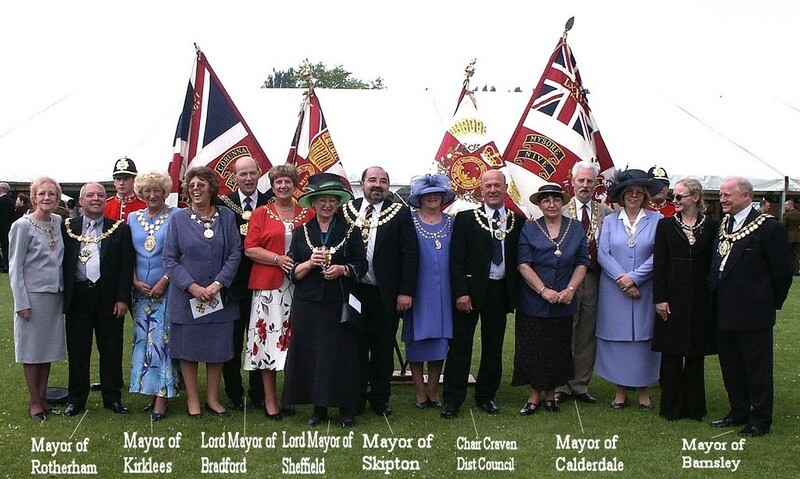 This Freedom was transferred to the Dukes as the Freedom of the City of Bradford in 1996. Keighley Town Council was created on the 1st of April 2002, following an order from the Office of the Minister of State. Keighley then elected its own Mayor and Town Council and was no longer covered by the Freedom of Bradford City. Only Keighley Town Council can confer the Freedom of the Town. In 2002 the Mayors, and their escorts, from the towns then associated with the Regiment attended the Regiments Tercentenary in Osnabruck, Germany.